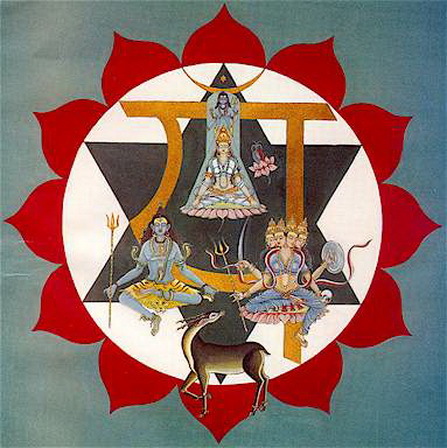 Anahata (Sanskrit: अनाहत, Anāhata) is the fourth primary chakra according to the Hindu Yogic, Shakta and Buddhist Tantric traditions. 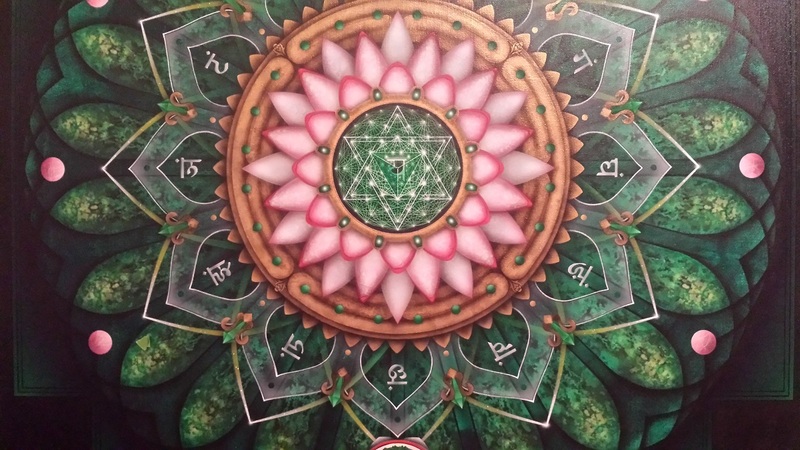 In Sanskrit the word anahata means “unhurt,” “unstruck,” or “unbeaten,” meaning the sound was created without using a strike or a pluck or any other kind of disturbance that normally creates sound waves in air. 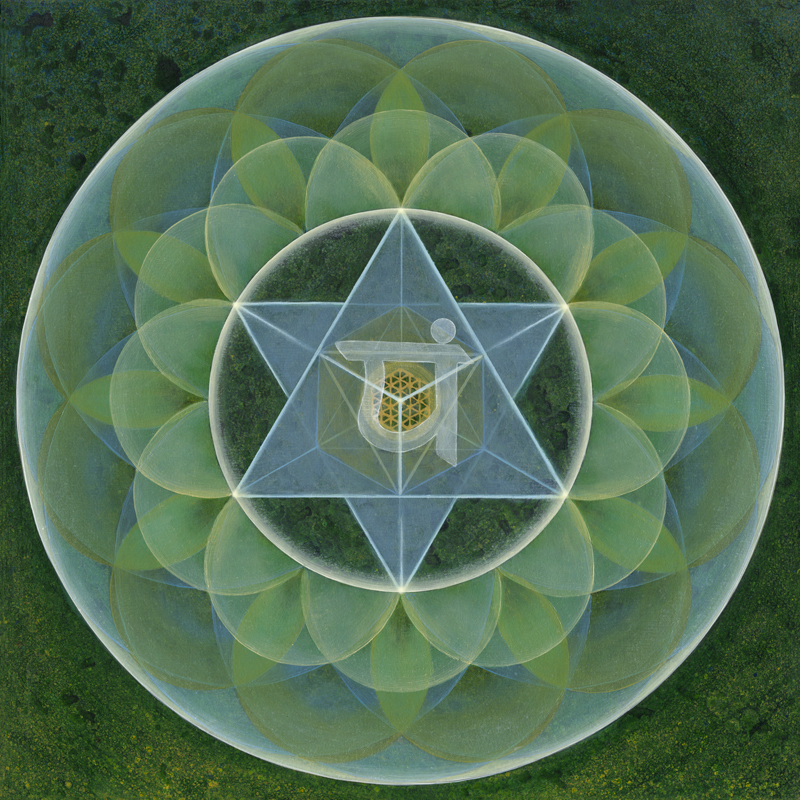 Anahata Nad refers to the Vedic concept of unstruck sound, or the sound of the celestial realm. 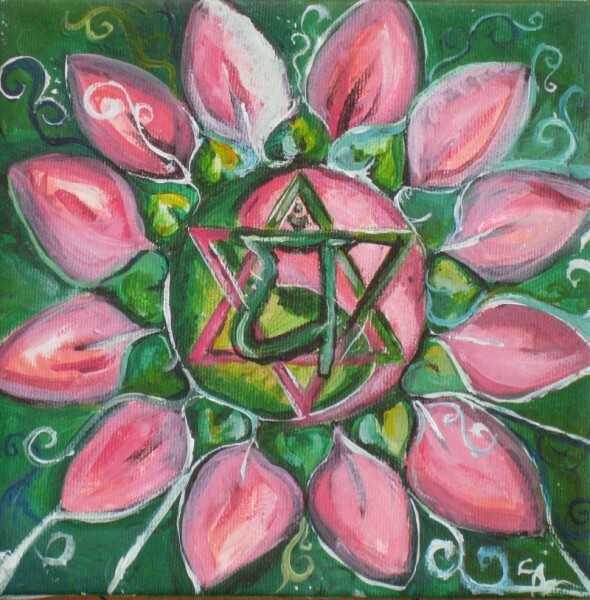 Anahata is usually associated with a calm serene sound, without disturbance or dissonance. 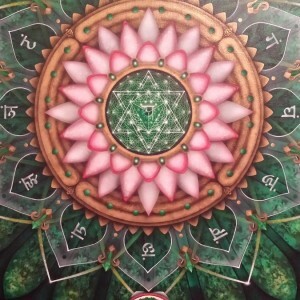 The Anahata Chakra, often called the Heart Chakra is the center point, the place of balance, the kernel of truth, the essence of the self, the core, the spiritual center, and the balancing point between the inner and outer, between above and below. The Heart Chakra acknowledges that it is when we come into wholeness that we plant the seeds of inner peace. 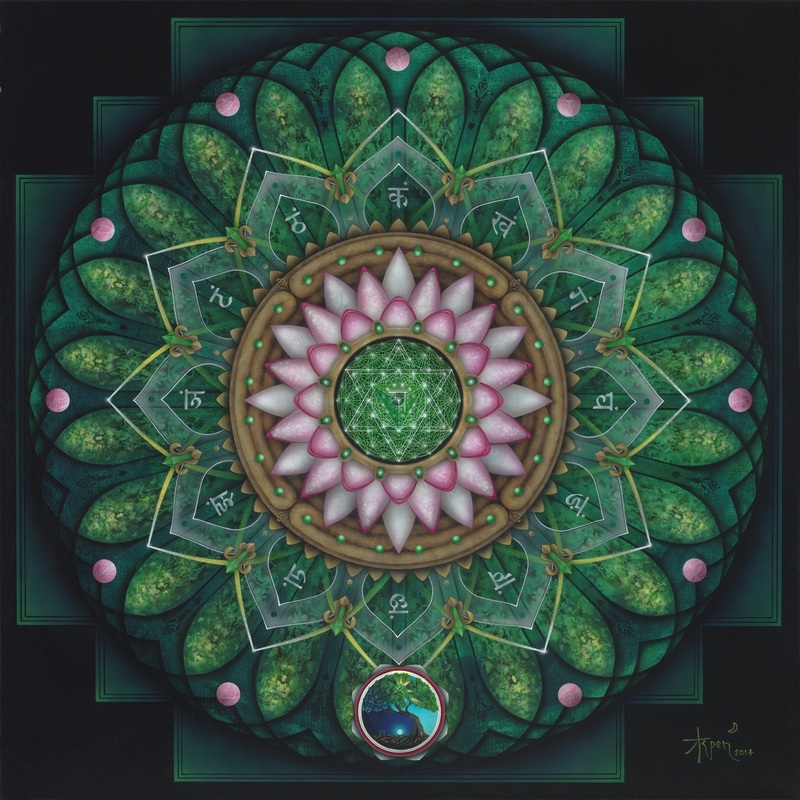 Representations of the Anahata Chakra are varied and many and range from detailed, fully iconic renderings based on the classical view of the Chakra to simple geometric forms—literally thousands of wonderfully unique ways to represent the Anahata Chakra are available online. My version keeps some of the basics, but also elaborates certain aspects. 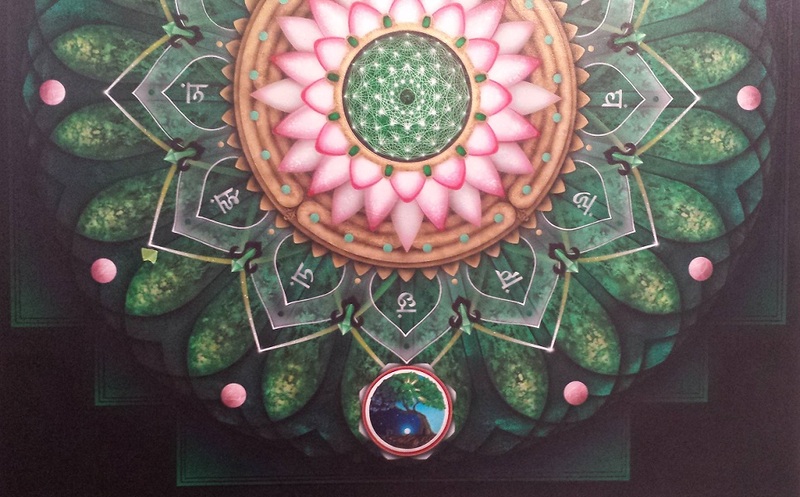 The most basic portrayal of the Anahata Chakra is the 12-pedaled lotus with a shatkona, which represents the union of the masculine and feminine forces, in the center. 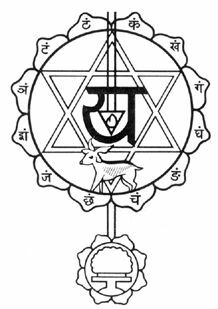 Commonly the letter Yam (Sanskrit: य ) is included and would be a sure indication that it was intentionally an Anahata Chakra symbol rather than just a geometric or 12-pedaled flower. Beyond that is a spectrum of different representations which incorporate an array of additional symbols, including archetypal deities. Fully elaborated portrayals can feature Ishana Rudra Shiva and Kakini Shakti separate, and then Kundalini Shakti and Rudra Shiva together (i.e. in symbolic union). 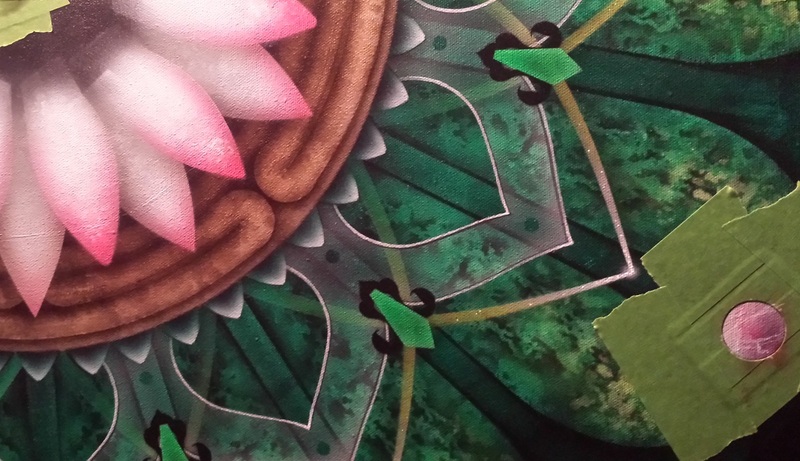 The rose window section of my Anahata was created using the ubiquitous, iconic heart shape. Simply spinning around the heart pattern around a center point at every 15 degrees arc (i.e. 360 / 24 = 15) created the pattern (i.e. a common heart pattern painted 24 times). I’m often quite dazzled to discover the beauty that simple geometry creates. It is, after all, our underlying structure—from our DNA on up to the proportions of our extremities. We are literally crystallized into being. But I wanted to insinuate that we’re crystallized through the interweaving of others—12 pairs of hearts come together to weave the background (i.e. our context of being). 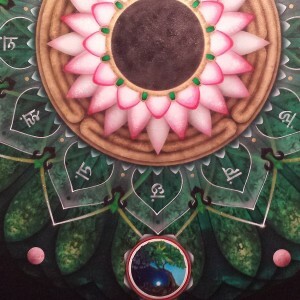 Behind this is the chakana, or Aztec Cross, which symbolizes the three levels of existence—Hana Pacha (the upper world inhabited by the superior gods), Kay Pacha (the world of our everyday existence), and Ucu or Urin Pacha (the underworld inhabited by spirits of the dead, the ancestors, their overlords and various deities having close contact to the Earth plane), (Source: Wikipedia). The chakana can also represent the Tree of Life. Placed in this artwork as the structure supporting the blossoming heart, it suggests the boundless reach of our hearts—to the heavens, to our ancestors, to all who live. 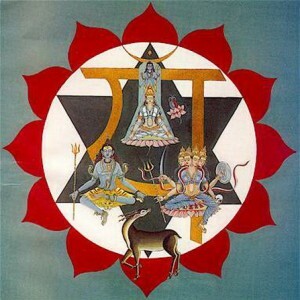 An often overlooked part of the Anahata Chakra is a lower positioned, minor chakra called the Hrit, Hridaya (meaning “heart”), or Surya Chakra, which is an eight-pedaled lotus containing the Kalpavriksha, or wishing tree. It is from this minor chakra (but more literally the heart chakra) that one affirms the ability to manifest whatever one wishes in this world. The wish fulfilling tree is a part of many cultures throughout the world and could easily been asserted as an early incarnation of our modern Christmas tree. Here is the altar upon which the wishes of your heart are laid. I could go on and on…about the Sanskrit symbols, about the associated gods, the antelope, or about the associated elements and words and sounds and crystals and flowers, or about the deeper meaning of the colors or the form… But I’ll leave all of that to other experts and the thousands of pages of information available online. Just follow the thread that is given to you, motivated and linked by your own interests and desires. The aforementioned Wheels of Life is a good resource to get you the basics as well as some deeper concepts. Beyond that, I’ll leave to your imagination, meditation, and discovery. Moreover, the discovery of your true heart is a personal journey. Not me, nor anyone else for that matter, can tell you what path to take. This path is all your own. 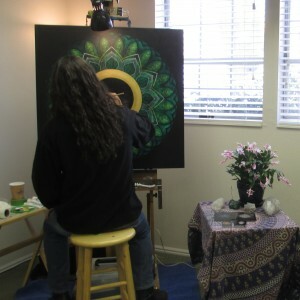 Here are some photos of the 5-month process of creating Anahata. Hi! The online store is currently offline, but will be back later this summer. 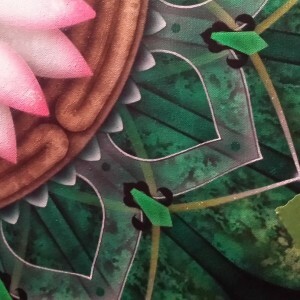 Limited digital prints, canvas and paper giclees, and stickers of Anahata will be available at that time. Thanks for your interest. 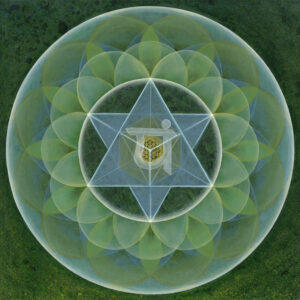 Anahata Chakra, located in the middle of the chest is the place where our spirit or true self resides. 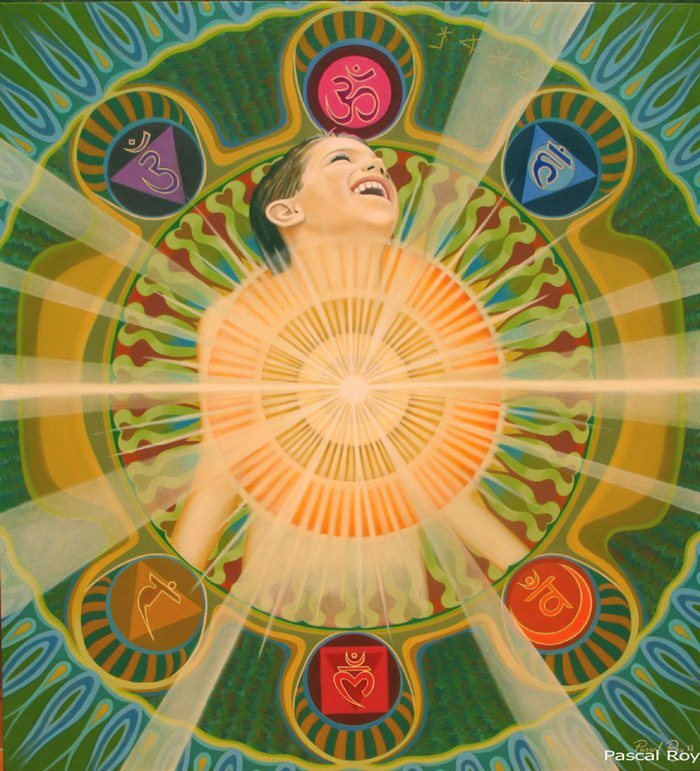 After our self-realization, we connect to our spirit and become aware of it. Beautiful work.I would Love to have a printed work of this amazing work.Hope that soon will be availabre to sell. I also mention that I am a therapist , Lisbon-Portugal.I was searching for Anahata images to support a special workshop to be realized .And I found this beauty.Thank you again. Hi,Your artwork is beautiful. Would you ever design a logo for a small business owner? Thanks for the kind words and I’m happy to hear the art speaks to you. Regarding doing custom design, I have done some in the past and do very selective projects–if it is something that personally interests me and might be something I can pull off confidently. So perhaps you could email me what you might be seeking. Use the contact form. This image is extraordinary! What a labor of love. 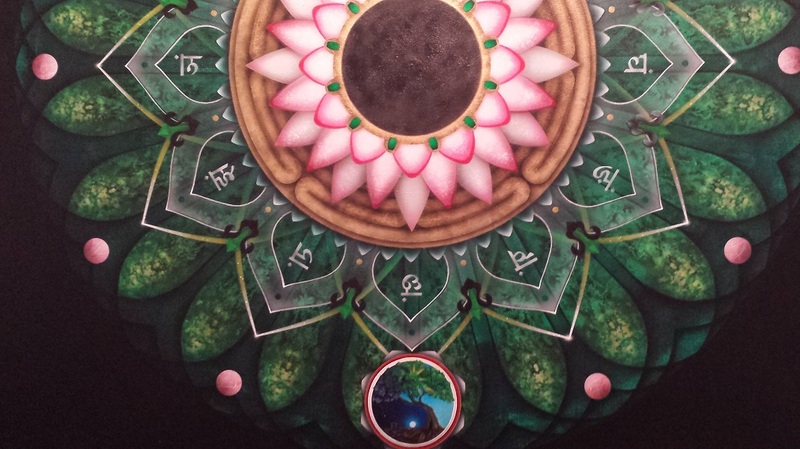 Harnessing the Power of the Heart for Your Healing Practice, and I would dearly love to use this painting, or parts of it, on the website and banner.. I would be glad to pay you for permission to do that. Please contact me at joy@rmamysteryschool.com. Let’s discuss this via email. Use the contact form to write me and help me understand what you’re seeking to do. LMK if you have samples or examples. Also, please read my image use policy and it should inform how we’ll want to decide how to use the art on your sight. 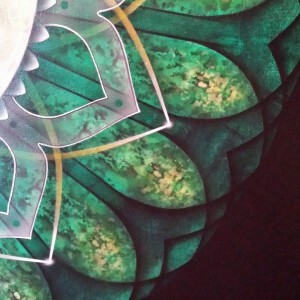 http://aspenmoonart.com/image-use-policy/ I imagine we’ll be able to work something out. 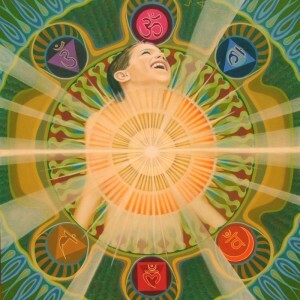 I am writing on behalf of Joy Gardner, who had recently contacted you through your website to inquire about the possible use of your Anahata image and the conditions connected to that. 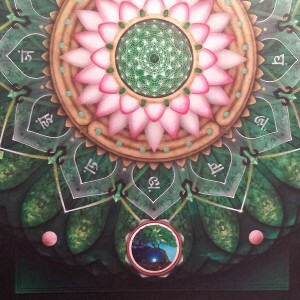 The desired use for your amazing mandala and perhaps some of your other work would be a website featuring a telesummit with a variety of speakers on the topic of how to harness the power of the heart, gaining growth from pain and how to apply this to the healing practice of the attendees, students and audience of the videos. This website will be newly created in the coming weeks. She would like to feature it on the page, of course with links to your site, your name and additional space (1/4 page) for your advertisement. We read through your image policies and I already saw that you don’t allow your image to be cropped or changed in any way, so that answers the question about using it as a banner. We are open to your suggestions for this specific purpose. What is your fee for using the image in one location on the website? Do You Feel an Inner Calling? I mentor integrative health practitioners who are tired of the band-aid approach to medicine, who yearn to ride the wave of energy medicine, using their hidden gifts to give and receive deep soul healing, while preparing themselves to be the healers of the future. 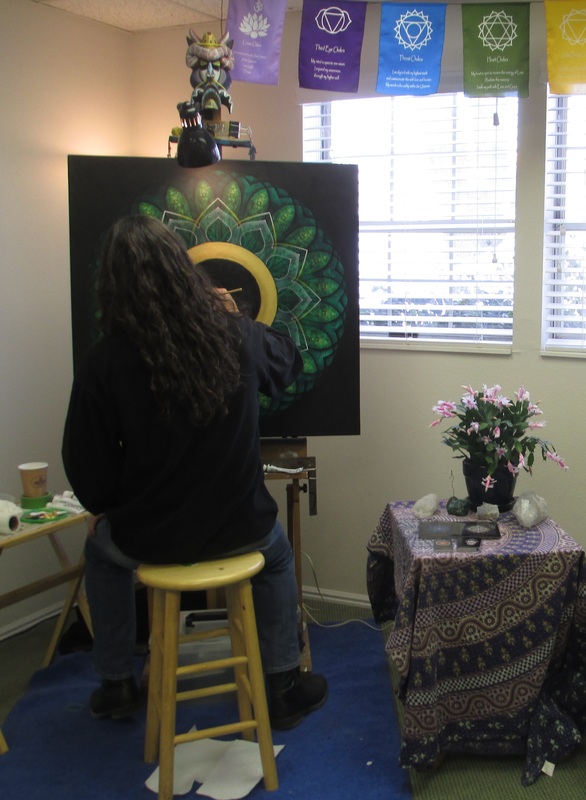 The Mission of the RMA Mystery School is to bring together holistic, allopathic and closeted health practitioners who yearn to develop their hidden gifts and to evolve spiritually, while taking great care of their bodies and creating fulfilling careers in energy healing.